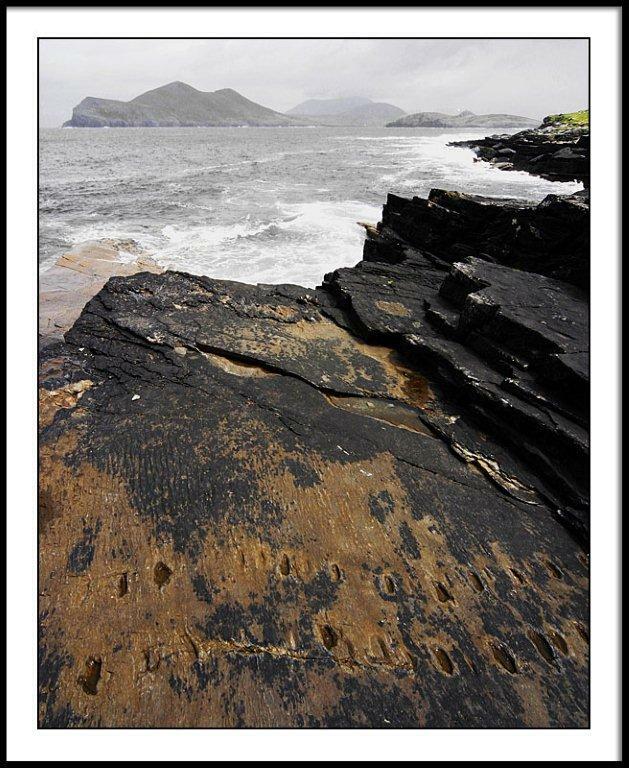 A set of footprints from a four-legged creature dated at about 385 million years old were found on the shoreline of this County Kerry island. The instant you see them you are filled with curiosity about the animal that made them and the world it lived in. At that time early amphibians had also started to evolve and walk on land. These creatures were the beginning of land based evolution and they wrote their story in the “ROCK of The HOOVES” on Valentia Island just off the coast. In 1992 a Swiss Scientist discovered scientifically the metre long tracks in an area called the ‘Rock of Hooves’ were that of a Tetrapod. A groove left by its belly reveals that it walked low to the ground, and zig zag marks behind the tracks show that its long tail was dragged behind it. It may have looked like a giant mute or salamander, the scientists are not sure. The tetrapods existed at the time when evolution was producing a number of different patterns in creatures. Some tetrapod prints around the world show them with eight digits on each foot, but the print on Valentia Island do not show any. The Swiss scientist was not able to explain why it left the water, but speculated, that it may have been avoiding predators, or it may have needed to migrate from one pool that dried out to another. What we do know, is that this step lead to the development of land based animals and eventually to humans. The tracks found to-day were made before a major flood, during which the tracks were covered and preserved in silt. After millions of years of weight and pressure, and weathering the silt formed silt stone and the footprints were revealed.